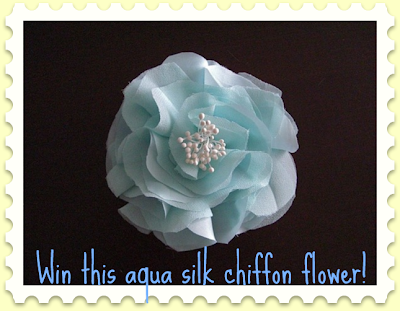 Live Adorned: Silk Chiffon Flower Clip Giveaway! Lovelies, we have a very exciting giveaway for you today, all the way from Hawaii! Live Adorned, based in Honolulu, is a gorgeous store which features all the perfect bridal accessories. What I love about the handcrafted items in Live Adorned is that they are all so versatile! Feel like clipping your chiffon flower to your veil, and then your shoes, and then your tank top? Go for it! All of the accessories are feminine, classy, and would surely add the perfect touch to not only your bridal outfit, but for anytime you feel like feeling pretty! We're very lucky today because Live Adorned is happily giving away one silk chiffon flower clip, which you can wear however you like (bridal or not!)! Romantic Silk Chiffon Camellia Flower in Aqua / light turquoise. Color is a mint aqua color, light turquoise with a hint of green. Made of layers of handcut and hand sewn silk chiffon with poly silk layers for body. Beautiful! Attached to an alligator clip for versatility - can be worn with a sash, belt, in your hair alone or with a headband. How can you win this beautiful flower from Live Adorned? It's so easy! Head over to Live Adorned and take a look around. Come back here, to this post, and let us know in the comments, which your favorite item is. Make sure to leave a way to contact you in case you win! You may enter as many times as you please. Contest ends June 21st at 12PM EST. Special wedding additional entry (answer in another comment): What was/will be/would you like to have as your "wedding flower"? 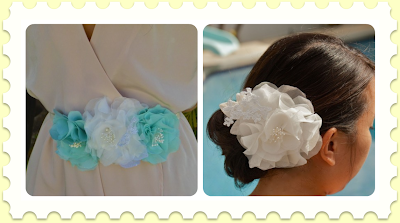 I adore the AVIA - Large Bridal White Silk and Organza Flower Camellia Fascinator! As to wedding flowers I think there will have to be white roses! My favorite is the Black rosette and feather shoe clips. My wedding flowers were Calla Lillies and Orchids! At our wedding, we had peonies, orchids and ranunculus in shades of hot pink and light pink. I love the ivory and pearl headband. At our wedding we had hydrangeas with white roses as an accent. I hope Daisies will be my wedding flower! Since I have to choose one favorite, I'll choose the Georgia Peach flower - very pretty! Love, love, love!!! The Aurora fascinator clip is definitely my favourite. I LOVE the black chiffon and lace shoe clips! My wedding flower was the calla lily. LOVE it. I love the GEORGIA PEACH - Peach silk and organza camellia hair flower pin brooch! I would like daisies to be my wedding flower, someday! I like Friend Lovely at Your Side on Facebook as latanya t.
I love the AVIA - Large Bridal White Silk and Organza Flower Camellia Fascinator. Beautiful! I love the AUTUMN double flower skinny headband, it's really cute! I love the Georgia peach! My wedding flower was calla lilies. the ADELAIDE fascinator, so classy! I would love to work as a flower arranger for weddings, in fact. Hmmm - I love flowers and wish I could get married once a year (to the same guy! )just so I could try out different floral arrangements...! Love the AVA Ivory Bridal Silk Chiffon & Organza Camellia flower with lace. We had white tulips and white hydrangea at our wedding. I like the Bridal Ivory White Silk flower with russian veiling and rhinestone center. I would definitely wear that on a blazer for a formal event. I also really like the Black chiffon and lace shoe clips. So formal and pretty! And also adore the ADELAIDE - Bridal White Ivory Chiffon and tulle flower fascinator. So pretty!! Also, I'm already a fan on FB! I think my flowers will be lillies or orchids. the Georgia peach set is lovely! my wedding flower was white and pink sweetheart roses. I would love to win this for my Fiance for our wedding. She loves this color. She would also like the ivory headband they offer. I liked Lovely at your side on Facebook!